Does anyone remember Rachel Whiteread’s House, which won the Turner Prize in 1993? It is striking how of its time the piece is now. That reads like a polite way of saying it has dated, which has a grain of truth, so I’ll leave it in. This short video will jog readers’ memories. Looking back, House fits precisely with the early 1990s postmodern (‘pomo’) Zeitgeist, where insides and outsides and the permeable, shifting liminal zones between them were in a flux of radical undecidability, even of alterity. Clearly, the period’s critical theory buzzwords still flow fluently. In 1993, I was a student of English literature, particularly taken with critical theory, and it shows. It also explains why House made its mark on me, or should I say, it accounts for the continuing inscription of the Zeitgeist‘s discourse onto the palimpsest of my (en)cultur(at)ed Weltanschauung. Still, it’s easy to sneer. From Zeitgeist to Geistzeit. It was Halloween when I first noticed the moulding on this exterior wall of a basement in Dublin. Perhaps it was something to do with the way the drapes hang like a white-sheet ghost that drew my attention. The moribund plant container and the odd negative jail-cell bars on the frosted glass certainly played a role too. But I think it goes deeper than just association of ideas. Things that are inside-out can be disturbingly uncanny because they give solid form to what is not normally solid. That is not to say that inside-out buildings are always uncanny – the exposed entrails of the Centre Georges Pompidou or of the Lloyds Building are merely interesting. But when a building or its surfaces bear the trace of something now missing, as in House, or when concrete bears the mark of the piece of wood that contained it (example here), we are faced with some kind of ghostly remnant (if this sounds like Derrida, it is because it occurs to me that his Specters of Marx also dates from 1993). 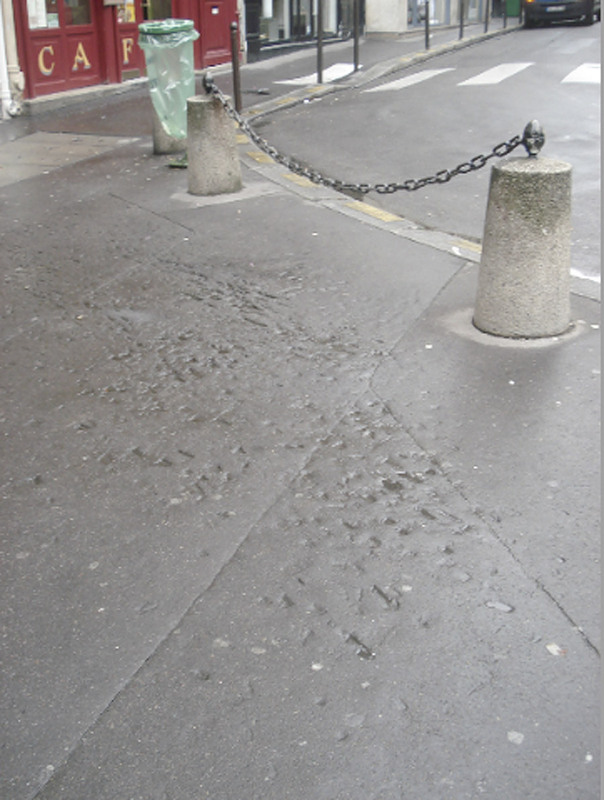 On a cold winter’s day in Paris, when you notice the marks where, months before, the kickstands of parked motorbikes have sunk into the softened tar, the ghostly heat of that summer’s day brushes your cheek. 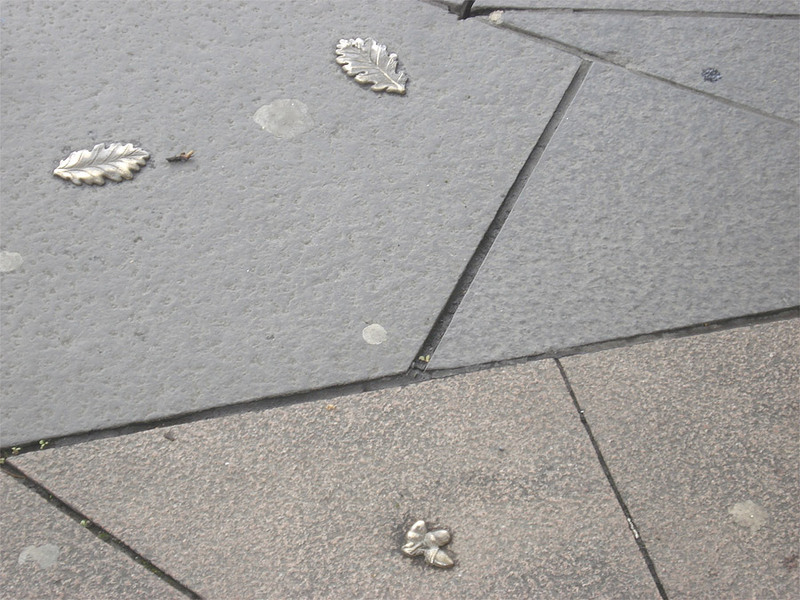 In Derry, are these micro-sculptures meant to be emerging from beneath the pavement, or have they fallen from above? Either way, they are imprints of the missing oak wood – Derry comes from ‘Doire’, which means oak wood – that once occupied this spot. The name of the city is contested – officially it is Londonderry, the colonial name, but the great majority of its residents call it simply Derry. The micro-sculptures are evidence that the ghost of the original wood has not forgotten, and will not forget, that this is an undead doire. It’s a good example of how the nationalist population of that city have won the cultural war, spending UK-exchequer money on deconstruction-influenced sculpture that proclaims the passing nature of the centuries-long British occupation. 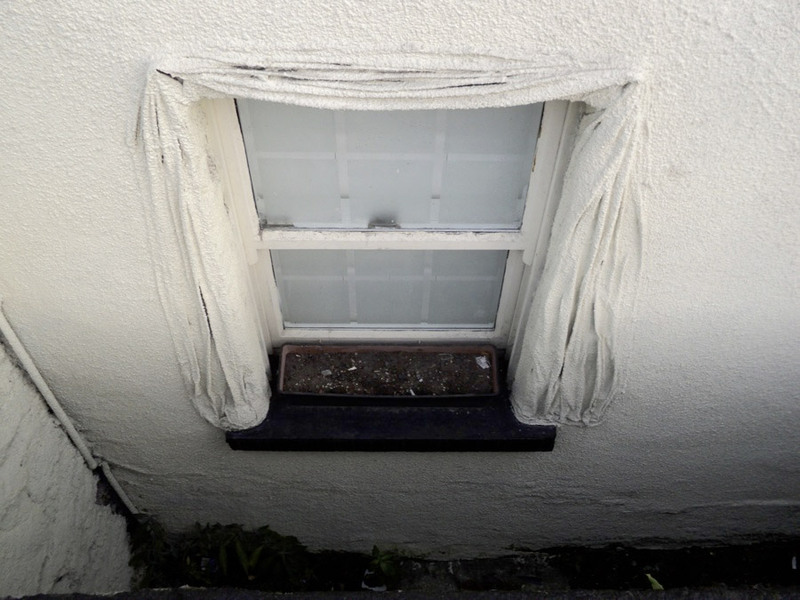 The grisly curtains in Dublin make me wonder, with a quickening of my pulse, if the original curtains are still in there, undead and entombed inside the plaster? Whiteread’s scultpure always did have something of the sarcophagus about it, as if some ghastly entombment had happened there. Years after House was demolished, I lived in London and for a long while passed the spot regularly without knowing what had stood there. What I always thought of as I passed that spot was how 200 people were made homeless and 6 were killed there in 1944 by the first successful German V-1 ‘flying bomb’. There’s no trace of that.